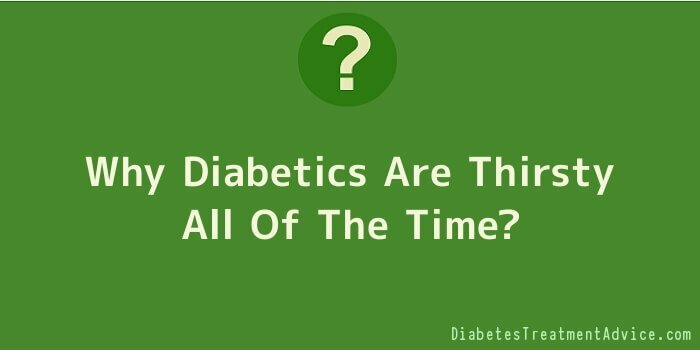 Why Diabetics Are Thirsty All Of The Time? Diabetes is a chronic disease that affects millions of Americans. It’s already become an epidemic among today’s youth. Diabetes is caused by a malfunction of the body which leaves the body unable to properly regulate its blood sugar levels. But how do you identify it? There are more than a few diabetes symptoms including tiredness, a sense of numbness in the limbs such as the feet and hands, blurred eyesight, and slow healing of injuries. But among the first signs, is a need for frequent urination accompanied by incessant thirst. A frequent need to urinate and thirst can be induced by a lot of things, but these are also symptoms of type 2 diabetes. In fact, many times diabetes is first noticed in children when they suddenly begin bedwetting out of the blue. The combination of the need to urinate and thirst creates a vicious cycle. Here’s how it works. Diabetes is an excess of sugar in the blood, and when someone’s blood sugar level becomes extremely elevated, the body needs to get rid of some of it. In a normal person, the body gets rid of excess glucose by eliminating it through the urine. In order to make the urine, however, the body needs water – so it makes the person thirsty. The thirst causes them to drink more liquids – water, juice, or whatever. Of course, drinking more water increases the need to urinate – which they do, thus eliminating some of the excess glucose from the body. The excessive urination, however, also drains necessary water from the body, leading to dehydration which causes the person to become thirsty again. The cycle then repeats. Someone not having diabetes will likely never go through this cycle. She will become thirsty, drink water or a beverage to quench the thirst, and go on about her everyday business. Many people that have diabetes, however, never notice the cycle as it is gradual. And before too long they perceive their thirst and urination needs as natural.